Distance travelled: 910 km. Total from Lawra - to departure from Burkina border (Seytanga) for Niger. Very good piste road to Leo with a very good 'chop' stop for barbecued lamb - just opposite the market place, then first class paved (peage) road to Ouagadougou . First challenge/now sorted : the rear door lock on Mitzi (Pajero) decided to stop working. Got a temporary fix in Ouaga at New Garage, a very good Lebanese run garage (proprietor - George), would definitely recommend to a friend. Works fine now. Second challenge/resolved: we could not get Nigeria visa here (as suggested in Lonely Planet - only if you are a resident of Burkina). We were assured we can get it in Niamey, Niger. 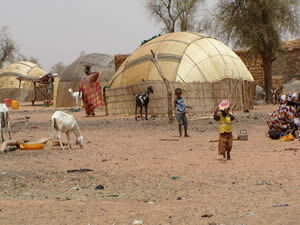 So tomorrow (Friday 20th) it's off to Kaya, Gorom - Gorom, Oursi, for a couple of nights and then to Tera and Niamey (capital Niger) for the Nigeria visa on Monday/Tuesday. Nigerian Ambassador assured us that the maxim is to say you are tourists (not on official business - as that is a whole new ball-game), and you will have no problem obtaining visas in each country, for the next country. Third challenge: we cannot get Gabon visa here as suggested in Bradt guide - will have to get it in Yaounde (Cameroun) later. A lovely swim in the Hotel Ricardo swiming pool . Oops - forgot - sorry you VSO's in deepest Ghana, but enjoyed a ham, gruyere cheese, cornichons and tomato bagette - vive la France! Bumped into a Swiss couple, Jurg and Erika travelling down from Switzerland to Accra - would have liked to join up if possible but our plans are out of synch! A good drive to Dori - overnighting at the Oasis Hotel (£25 - a room)- a euphemism for an industrial estate - but OK. Picked up a guide (Pablo), visited interesting, but familiar to us, Peul and Fulani villages + really impressive Market Gardening project at De Djomba. 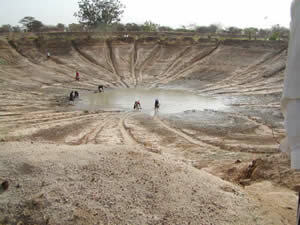 A huge artificial crater which fills up with water in the rainy season and provides irrigation, by watering-can, for very productive salad and vegetable production. Slept overnight in the Dunes at Oursi, shambolically disorganised, so disappointing - but still OK.
Did the camel ride and local museum. Met Tom, a gap year student from UK meandering around Burkina. Back to Dori, Hotel Dintal this time, (about £18 for the room) cheaper and better than Oasis. Enjoyed 'poulet - bicyclette' at the Pandor roadside cafe - delicious (£4 for 2 barbecued chickens between 3 of us). 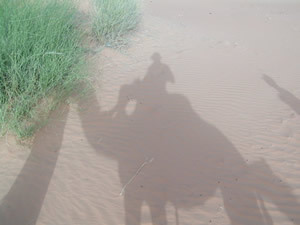 Departed Dori for Burkina border (47km) at Seytanga and then, 40km of 'no-man's land' later, arrived at Tera - (Niger Border) after crossing very remote and sandy Sahelian semi-desert. Very tricky route finding and vehicle handling in deep sand. 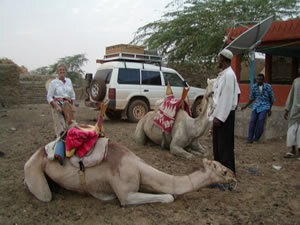 Eventually found Niger Immigration for passport stamp and then customs (Douane) for Laissez -Passer (vehicle permit).